Among all color combinations one can choose, some are definitely meant to stay in style for longer. One timeless example is certainly black and white, which makes for a great choice in the living room. From daily moments of relaxation to guest entertaining, there are many things that happen in a living room, and the space always needs to look and function at its best. So, if you are wanting to give your room a remodel, consider going black and white! 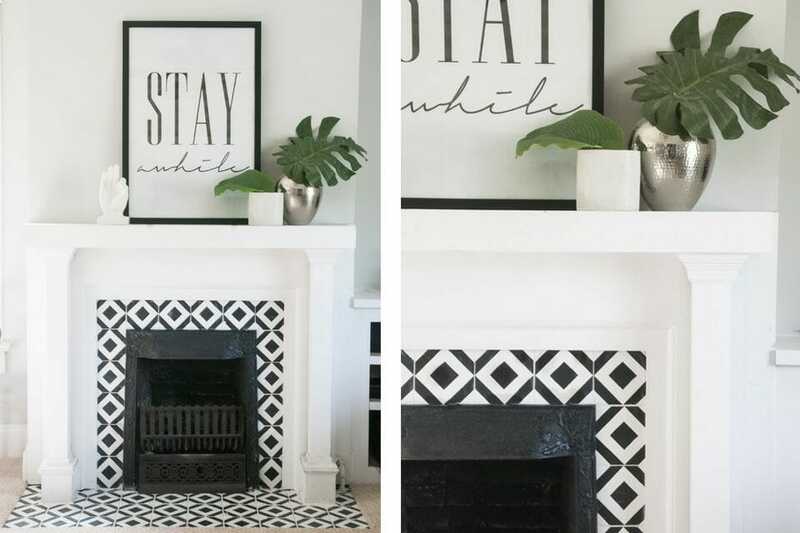 We have some low-budget tips to achieve great results for your new black and white living room decor without breaking the bank. Black and white decor can be summarized in few words: it is timeless, elegant and incredibly versatile. Through seasons and years, an optical palette will always work, making your living room look neat at all times. It fits any interior style! The striking contrast between the two colors is ideal to highlight special architectural details. Beams, columns and even door frames will immediately be emphasized and become a focal point in the design. 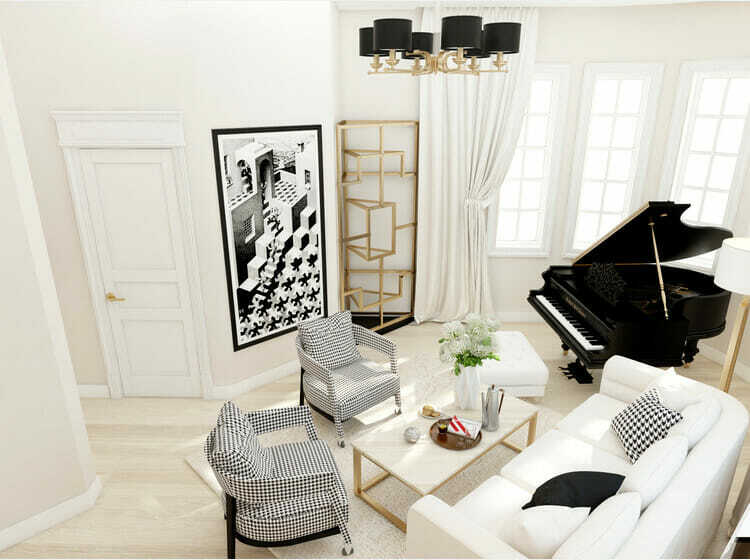 Black and white living room design by Decorilla designer, Renata P.
Black and white can also be used to intentionally create decorative features that will give character to the room. What about an optical tiling on the fireplace? Pretty spectacular, isn’t it? 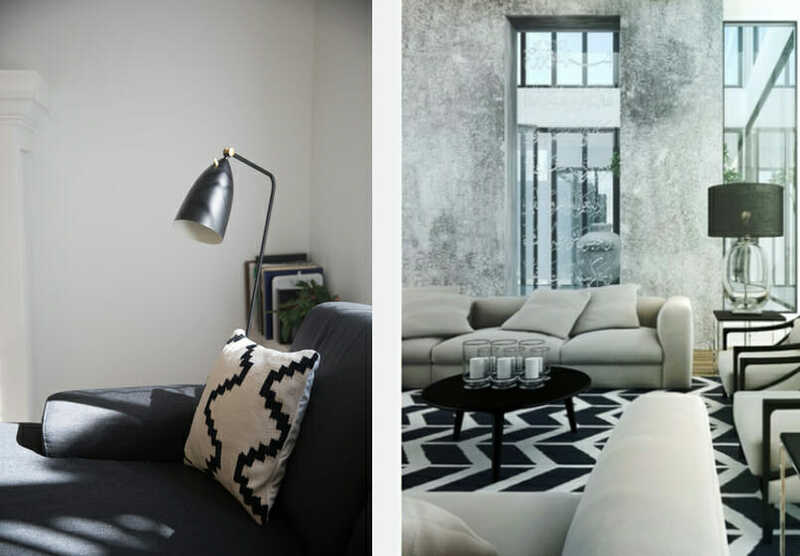 Playing with wall treatments is definitely a great idea when creating a black and white scheme. 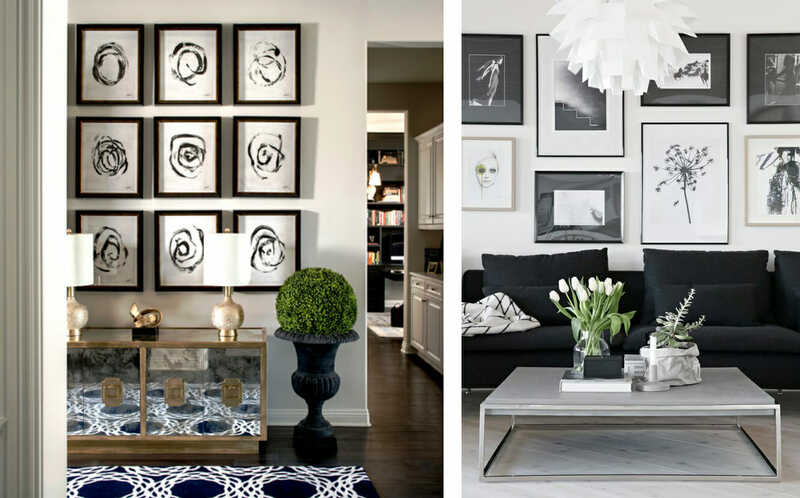 A gallery wall with black and white photos is probably the easiest way to get started and try an optical makeover. No matter if you choose equally sized pictures in a regular layout or all different pictures in a more irregular arrangement or even one single artwork; the effect will be impressive either way! Always remind that this is meant to be eye-catching, so don’t be afraid to go big! 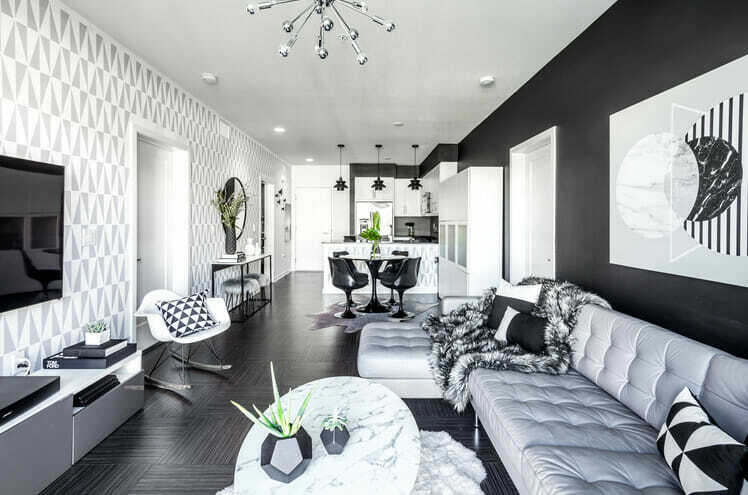 Black and white gallery wall design (left) by Decorilla designer, Corine M.
Black walls are certainly a bold and rather uncommon choice, but will certainly give big satisfaction to the brave ones that will try them! Paint, a black wood paneling or a striking black wallpaper will all create an amazing backdrop for your new black and white living room decor. 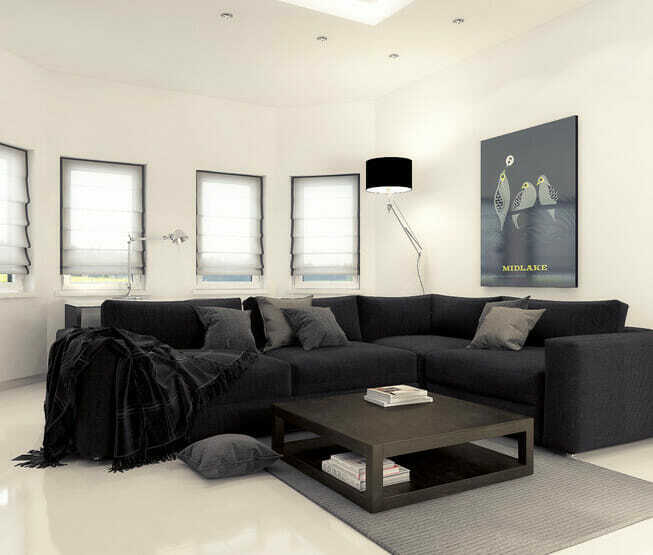 Black and white living room decor by Decorilla designer, Mladen C.
You can do the total opposite as well! Keeping your walls in total white and going for all-black furniture will be just as striking, and incredibly stylish too! Living room design by Decorilla designer, Eleni P.
Textiles are another place to play with black and white. Easy to bring in, they are the perfect way to introduce optical patterns. 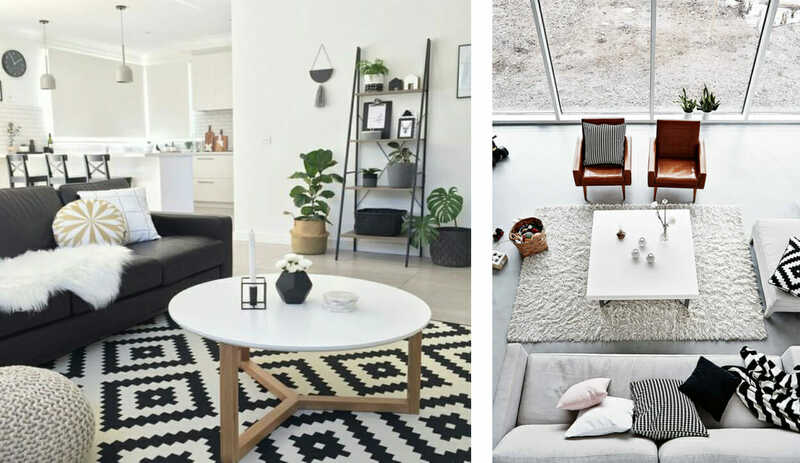 Cushions, rugs or patterned upholsterery will set the style of the space and give movement to the design while sticking to the black and white color palette. Even if you opt for a black and white living room décor, there’s actually still a place for some color. Few eye-catching pieces in a bold hue will be a great addition to the room and could even help you refresh your space with the flow of seasons. Design by Decorilla designer, Margaryta S.
Something as simple as one single wood accent, a leather chair or a natural rug are also going to get very special attention if used in an optical living room. Black and white decor also creates the perfect ambiance for all kinds of metallic accents. Gold, silver and copper will totally stand out and add tons of vibrancy to the space. Plus, they’re super trending these days! Black and white living room by Decorilla designer, Luba K.
Living room design by Decorilla designer, Michelle B. In case you’re wondering, black and white decor works perfectly even in a small space! It can be a particularly good strategy to give immediate character and with careful planning, it will not make the room feel smaller at all. The beauty of an optical decor is that it is an extremely versatile choice. 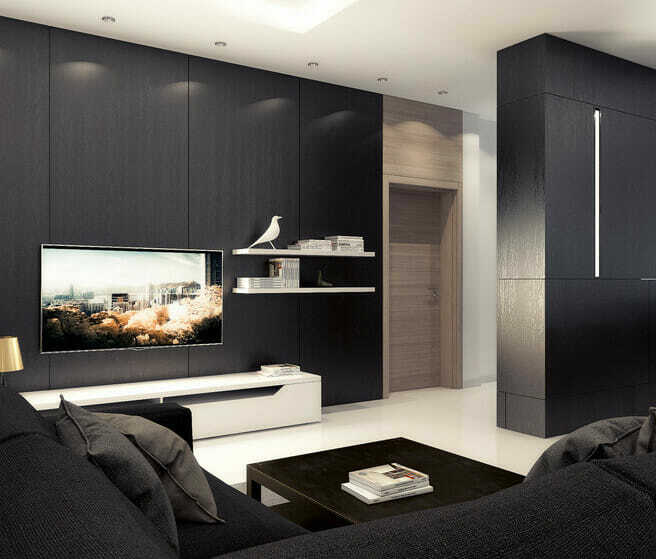 Going black and white on your living room decor will fit your interior tastes no matter what they are. From classic to contemporary, from bohemian to minimal, this color palette will always bring your space to the next level, giving it a timeless curate allure. 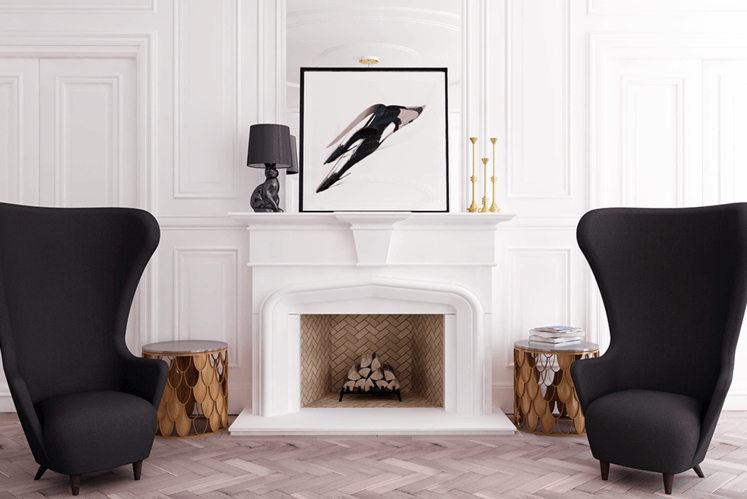 Are you ready to give black and white a try in your living room? Get started with a free Online Interior Design Consultation and find the best strategy to give your space the makeover it deserves!